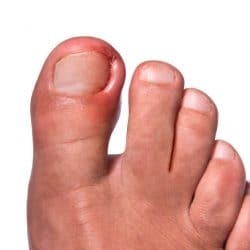 Due to their exposed location, finger and toenails take a lot of abuse. They are produced by living skin cells in the fingers and toes. They are composed primarily of keratin, a hardened protein found in skin and hair. Most injuries or conditions will heal on their own, although they may be unsightly for a while due to the slow growth rate of nails. If you do have a condition that is persistent, causes pain, or is simply an unusual change in your nails, it should be reported to your dermatologist. Most treatments are easy and highly effective. It is important to pay attention to changes in your nails because they can also be an early warning sign for a number of diseases and more serious conditions. If you notice changes in color, shape, swelling, pain, persistent white or black lines, dents or ridges – make an appointment at the office nearest you. Click below for information on the various conditions and the care we can provide.